I had a pair of layouts go up on the American Crafts blog yesterday for my spotlight, so I'm sharing them here today! Journaling says: Every day you just get cuter and cuter! We love that you're always so happy! Note: I LOVE the new Ready Set Go line by Amy Tangerine. I love how it can go either boy-y or girl-y depending on the colors you choose to use. I'm still in love with the banner trend so that's what I based this page around. I also paid a little tribute to Amy with some hand stitching since she's well-known for it! 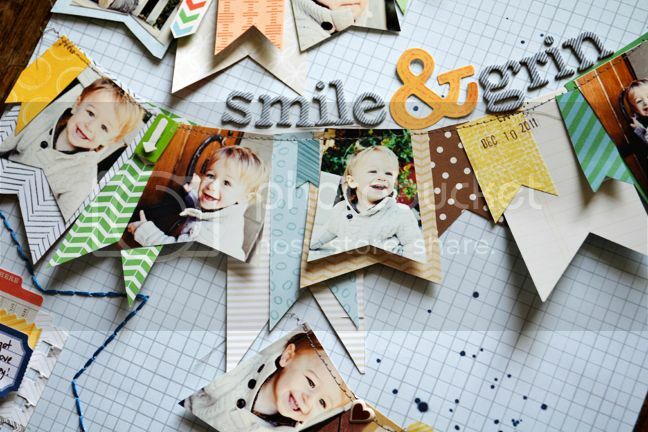 How to: Trim papers and photos into pennants, layer them in three banners across a gray grid paper background, and stitch across the tops using straight and zigzag stitching. 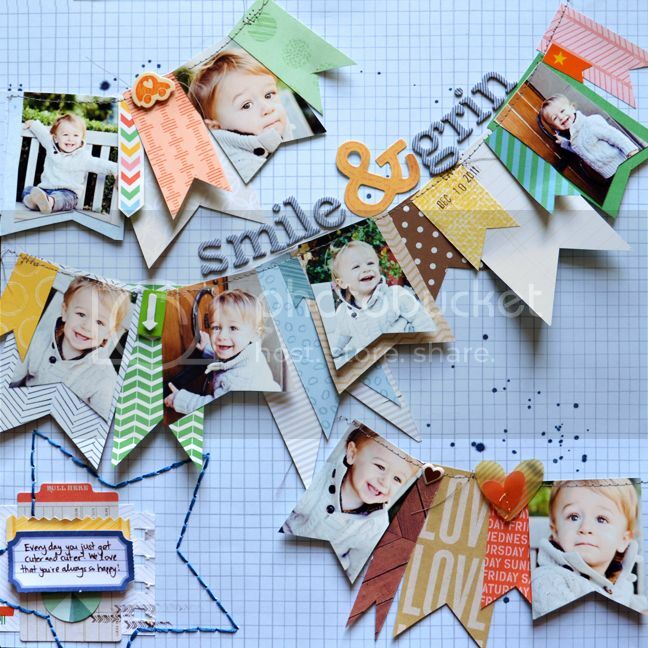 Add a few stickers and die cuts to the banners to embellish. Drop clusters of dark blue spray mist here and there. Create a journaling spot on the bottom left corner, hand stitch a star over it using blue floss, then add a title above the longest banner. Journaling says: You are simply the sweetest girl in the world! 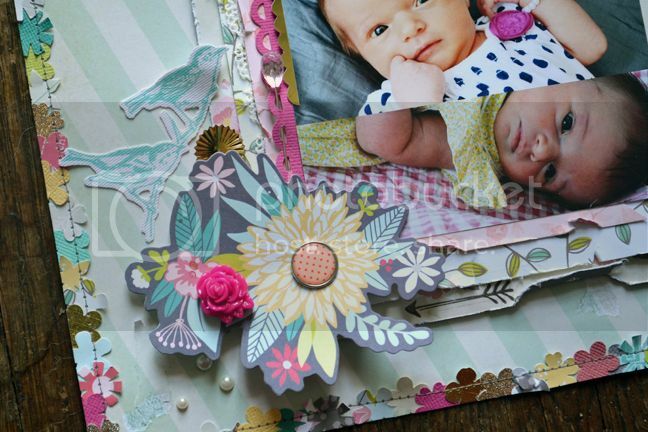 Note: How perfect is the 5th & Folic line for little baby girl pages? I think I could make an entire album filled with layouts of my new daughter Jane using this line! The colors are so soft and pretty and match her sweetness to a "T"! These layouts are so pretty. I love how you always have so much color. These are beautiful!! LOVING the border you created on the second one and loveeeeeee all the banners on the first one!!! GORGEOUS!!!! Love them both--SERIOUS eye candy--thanks! Love love love!!! I might have to try the pennant one... that seriously rocks!!!!!! Amazing work! So much fantastic colour and so lively! Love the banner idea!!! Most adorable! Thank you for sharing your story and love your layouts. Maybe some of your talent and creativity will rub off on me. Seriously amazing! I love what you do with paper. Gorgeous! I LOOOOOOVE these LOs--love the papers! I esp love the photo banners! AMAZING! 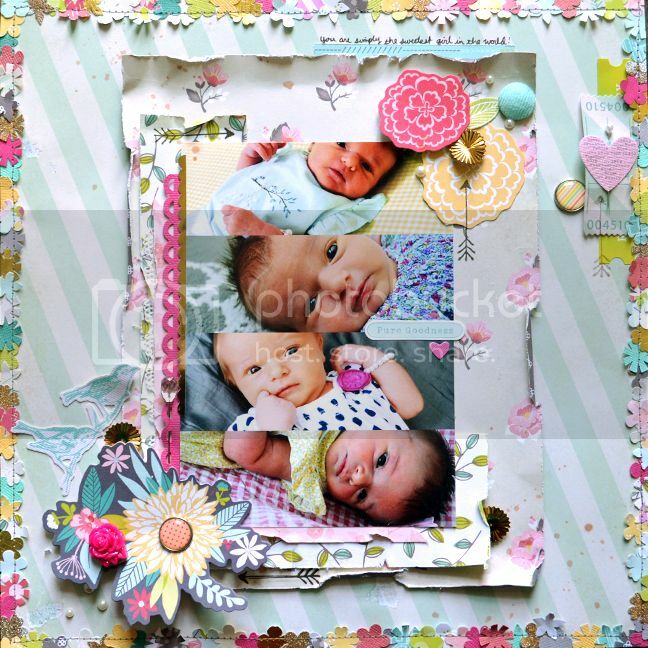 Really pretty and fun layouts! Especially the first one, those banners looks so amazing!